Entrapment neuropathies are a group of disorders of the peripheral nerves that are characterized by pain and/or loss of function (motor and/or sensory) of the nerves as a result of chronic compression. The brain and spinal cord receive and send information through muscles and sensory receptors, and the information sent to organs is transmitted through nerves. The nerves travel to the upper and lower extremities and traverse the various joints along their paths. Unfortunately, these nerves can become compressed or entrapped at various regions of the extremities, especially at "tunnel" regions, where they may be predisposed or vulnerable to compression. Neurosurgeons, among other surgical specialists (eg, orthopedists and plastic surgeones), treat these entrapment neuropathies, which can account for 10-20% of the practice’s cases. The first operations or decompressions for different nerve entrapments were performed more than a century ago, but the disorders were described even earlier by such pioneering physicians as Sir Astley Cooper (1820s) and Sir James Paget (1850s). An ulnar nerve transposed at the elbow is shown in the image below. Ulnar nerve (U) transposition at the elbow. A: The medial intermuscular septum (arrows) is resected to prevent compression of the transposed nerve. Vasoloops are around the ulnar nerve and a vascular pedicle between the nerve and the septum that has been preserved. B: After subcutaneous transposition, the ulnar nerve is observed lax in elbow flexion. The ulnar nerve and its distal branches are surrounded by vasoloops. This article summarizes some basic principles of entrapment neuropathies, and, within each section, the specifics of the most common entrapment syndromes are outlined. Together, this information should provide the reader with a solid basis for further investigation. In cases of nerve entrapment, at least one portion of the compressive surfaces is mobile. This results in either a repetitive "slapping" insult or a "rubbing/sliding" compression against sharp, tight edges, with motion at the adjacent joint that results in a chronic injury. Immobilization of the nerve with a splint or lifestyle adjustments may therefore resolve the symptoms. Entrapment neuropathies can also be caused by systemic disorders, such as rheumatoid arthritis, pregnancy, acromegaly, or hypothyroidism. Repetitive injury and trauma to a nerve may result in microvascular (ischemic) changes, edema, injury to the outside layers of the nerve (myelin sheath) that aid in the transmission of the nerve’s messages, and structural alterations in membranes at the organelle levels in both the myelin sheath and the nerve axon. Focal segmental demyelination at the area of compression is a common feature of compression syndromes. Complete recovery of function after surgical decompression reflects remyelination of the injured nerve. Incomplete recovery in more chronic and severe cases of entrapment is due to Wallerian degeneration of the axons and permanent fibrotic changes in the neuromuscular junction that may prevent full reinnervation and restoration of function. See Medical therapy and Intraoperative details. An TW, Evanoff BA, Boyer MI, Osei DA. The Prevalence of Cubital Tunnel Syndrome: A Cross-Sectional Study in a U.S. Metropolitan Cohort. J Bone Joint Surg Am. 2017 Mar 1. 99 (5):408-416. [Medline]. Schulte-Mattler WJ, Grimm T. [Common and not so common nerve entrapment syndromes: diagnostics, clinical aspects and therapy]. Nervenarzt. 2015 Feb. 86 (2):133-41. [Medline]. Moraes MA, Gonçalves RG, Santos JBGD, Belloti JC, Faloppa F, Moraes VY. DIAGNOSIS AND TREATMENT OF POSTERIOR INTEROSSEOUS NERVE ENTRAPMENT: SYSTEMATIC REVIEW. Acta Ortop Bras. 2017 Jan-Feb. 25 (1):52-54. [Medline]. Clavert P, Thomazeau H. Peri-articular suprascapular neuropathy. Orthop Traumatol Surg Res. 2014 Dec. 100 (8 Suppl):S409-11. [Medline]. Lanz U. Anatomical variations of the median nerve in the carpal tunnel. J Hand Surg Am. 1977 Jan. 2(1):44-53. [Medline]. Wilson KE, Tat J, Keir PJ. Effects of Wrist Posture and Fingertip Force on Median Nerve Blood Flow Velocity. Biomed Res Int. 2017. 2017:7156489. [Medline]. Ball C, Pearse M, Kennedy D, Hall A, Nanchahal J. Validation of a one-stop carpal tunnel clinic including nerve conduction studies and hand therapy. Ann R Coll Surg Engl. 2011 Nov. 93(8):634-8. [Medline]. Bland JD, Weller P, Rudolfer S. Questionnaire tools for the diagnosis of carpal tunnel syndrome from the patient history. Muscle Nerve. 2011 Nov. 44(5):757-62. [Medline]. Wichelhaus A, Emmerich J, Mittlmeier T. [Posttraumatic nerve entrapment syndromes in the upper extremities]. Unfallchirurg. 2017 Apr. 120 (4):329-343. [Medline]. Acioly MA, Soares AM, Almeida ML, Barbosa R, Daxbacher E, Carvalho CH. Modified simple decompression in the treatment of cubital tunnel syndrome: avoiding ulnar nerve subluxation. Arq Neuropsiquiatr. 2017 Apr. 75 (4):238-243. [Medline]. Gross MS, Gelberman RH. The anatomy of the distal ulnar tunnel. Clin Orthop Relat Res. 1985 Jun. 238-47. [Medline]. Ruder JR, Wood VE. Ulnar nerve compression at the arch of origin of the adductor pollicis muscle. J Hand Surg Am. 1993 Sep. 18(5):893-5. [Medline]. Fritz RC, Helms CA, Steinbach LS, Genant HK. Suprascapular nerve entrapment: evaluation with MR imaging. Radiology. 1992 Feb. 182(2):437-44. [Medline]. Rengachary SS, Neff JP, Singer PA, Brackett CE. Suprascapular entrapment neuropathy: a clinical, anatomical, and comparative study. Part 1: clinical study. Neurosurgery. 1979 Oct. 5(4):441-6. [Medline]. Birch R, Bonney G, Wynn Parry CB. Entrapment neuropathy. Surgical disorders of the peripheral nerves. Churchill Livingstone; 1998. 245-291. Wendt M, Novak CB, Anastakis DJ. Prevalence of cold sensitivity in upper extremity nerve compression syndromes. J Hand Surg Eur Vol. 2017 Jan 1. 1753193417728426. [Medline]. Nord KM, Kapoor P, Fisher J, et al. False positive rate of thoracic outlet syndrome diagnostic maneuvers. Electromyogr Clin Neurophysiol. 2008 Mar. 48(2):67-74. [Medline]. Wininger YD, Buckalew NA, Kaufmann RA, Munin MC. Ultrasound combined with electrodiagnosis improves lesion localization and outcome in posterior interosseous neuropathy. Muscle Nerve. 2015 Jul 22. [Medline]. Kim Y, Ha DH, Lee SM. Ultrasonographic findings of posterior interosseous nerve syndrome. Ultrasonography. 2017 Apr 5. [Medline]. Dellon AL, Hament W, Gittelshon A. Nonoperative management of cubital tunnel syndrome: an 8-year prospective study. Neurology. 1993 Sep. 43(9):1673-7. [Medline]. Fernández-de-Las-Peñas C, Cleland J, Palacios-Ceña M, Fuensalida-Novo S, Pareja JA, Alonso-Blanco C. The Effectiveness of Manual Therapy Versus Surgery on Self-reported Function, Cervical Range of Motion, and Pinch Grip Force in Carpal Tunnel Syndrome: A Randomized Clinical Trial. J Orthop Sports Phys Ther. 2017 Mar. 47 (3):151-161. [Medline]. Pirela-Cruz MA, Omer GF. Surgical exposure of the peripheral nerves of the upper extremity. Benzel EC, ed. Practical Approaches to Peripheral Nerve Surgery. American Association of Neurological Surgeons; 1992. 139-142. Palmer DH, Paulson JC, Lane-Larsen CL, Peulen VK, Olson JD. Endoscopic carpal tunnel release: a comparison of two techniques with open release. Arthroscopy. 1993. 9(5):498-508. [Medline]. Munns JJ, Awan HM. Trends in carpal tunnel surgery: an online survey of members of the American Society for Surgery of the Hand. J Hand Surg Am. 2015 Apr. 40 (4):767-71.e2. [Medline]. Bartels RH, Verhagen WI, van der Wilt GJ, Meulstee J, van Rossum LG, Grotenhuis JA. Prospective randomized controlled study comparing simple decompression versus anterior subcutaneous transposition for idiopathic neuropathy of the ulnar nerve at the elbow: Part 1. Neurosurgery. 2005 Mar. 56(3):522-30; discussion 522-30. [Medline]. Biggs M, Curtis JA. Randomized, prospective study comparing ulnar neurolysis in situ with submuscular transposition. Neurosurgery. 2006 Feb. 58(2):296-304; discussion 296-304. [Medline]. Gabel GT, Amadio PC. 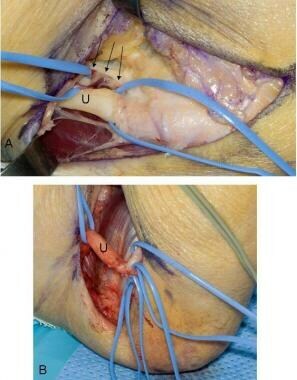 Reoperation for failed decompression of the ulnar nerve in the region of the elbow. J Bone Joint Surg Am. 1990 Feb. 72(2):213-9. [Medline]. Manske PR, Johnston R, Pruitt DL, Strecker WB. Ulnar nerve decompression at the cubital tunnel. Clin Orthop Relat Res. 1992 Jan. 231-7. [Medline]. Osterman AL, Davis CA. Subcutaneous transposition of the ulnar nerve for treatment of cubital tunnel syndrome. Hand Clin. 1996 May. 12(2):421-33. [Medline]. Learmonth JR. Technique for transplantation of the ulnar nerve. Surg Gynecol Obstet. 1942. 75:792-3. McGillicuddy JE, Harrigan MR. Meralgia Paresthetica. Techniques in Neurosurgery. 2000. 6(1):50-56.
de Ruiter GC, Kloet A. Comparison of effectiveness of different surgical treatments for meralgia paresthetica: Results of a prospective observational study and protocol for a randomized controlled trial. Clin Neurol Neurosurg. 2015 Jul. 134:7-11. [Medline]. Mackinnon SE, Dellon AL. Lower extremity nerves. Kline DG, Hudson AR. Nerve Injuries: Operative Results for Major Nerve Injuries, Entrapments, and Tumors. 1st ed. WB Saunders Co: 1995. 389-394. Morimoto D, Isu T, Kim K, Sugawara A, Yamazaki K, Chiba Y, et al. Microsurgical Decompression for Peroneal Nerve Entrapment Neuropathy. Neurol Med Chir (Tokyo). 2015. 55 (8):669-73. [Medline]. Yassin M, Garti A, Weissbrot M, Heller E, Robinson D. Treatment of anterior tarsal tunnel syndrome through an endoscopic or open technique. Foot (Edinb). 2015 Sep. 25 (3):148-51. [Medline]. Kuschner SH, Brien WW, Johnson D, Gellman H. Complications associated with carpal tunnel release. Orthop Rev. 1991 Apr. 20(4):346-52. [Medline]. Filler AG. Piriformis and related entrapment syndromes: diagnosis & management. Neurosurg Clin N Am. 2008 Oct. 19(4):609-22, vii. [Medline]. Tiel RL. Piriformis and related entrapment syndromes: myth & fallacy. Neurosurg Clin N Am. 2008 Oct. 19(4):623-7, vii. [Medline]. American Academy of Orthopaedic Surgeons. MANAGEMENT OF CARPAL TUNNEL SYNDROME EVIDENCE-BASED CLINICAL PRACTICE GUIDELINE. American Academy of Orthopaedic Surgeons. 2016 feb 29; Accessed: September 21, 2017. Moriarty JM, Bandyk DF, Broderick DF, Cornelius RS, Dill KE, Francois CJ, et al. ACR Appropriateness Criteria Imaging in the Diagnosis of Thoracic Outlet Syndrome. J Am Coll Radiol. 2015 May. 12 (5):438-43. [Medline]. [Full Text]. Dellon AL. Neurosurgical prevention of ulceration and amputation by decompression of lower extremity peripheral nerves in diabetic neuropathy: update 2006. Acta Neurochir Suppl. 2007. 100:149-51. [Medline]. Elliott R, Burkett B. Massage therapy as an effective treatment for carpel tunnel syndrome. J Bodyw Mov Ther. 12/2012. 17(3):[Medline]. Galardi G, Amadio S, Maderna L, et al. Electrophysiologic studies in tarsal tunnel syndrome. Diagnostic reliability of motor distal latency, mixed nerve and sensory nerve conduction studies. Am J Phys Med Rehabil. 1994 Jun. 73(3):193-8. [Medline]. Kline DG, Hudson AR. Vertebral artery compression. J Neurosurg. 1995 Oct. 83(4):759. [Medline]. Kureshi SA, Friedman AH. Carpal Tunnel Release: Surgical consideration. Techniques in Neurosurgery. 2000. 6(1):5-13. LeRoux PD, Ensign TD, Burchiel KJ. Surgical decompression without transposition for ulnar neuropathy: factors determining outcome. Neurosurgery. 1990 Nov. 27(5):709-14; discussion 714. [Medline]. Ochoa JL. Genesis of the structural pathology of myelinated fibers in median nerve entrapment. Muscle Nerve. 2012. 46(6):978. [Medline]. [Guideline] Tubbs RS, Mortazavi MM, Farrington WJ, Chern JJ, Shoja MM, Loukas M, et al. Relationships Between the Posterior Interosseous Nerve and the Supinator Muscle: Application to Peripheral Nerve Compression Syndromes and Nerve Transfer Procedures. J Neurol Surg A Cent Eur Neurosurg. May/2013. EPub ahead of print:13. [Medline]. Yalcin E, Unlu E, Akyuz M, Karaahmet OZ. Ultrasound diagnosis of ulnar neuropathy: Comparison of symptomatic and asymptomatic nerve thickness. J Hand Surg Eur Vol. 4/2013. [Medline]. Chest PA radiograph showing a right cervical rib (arrows), a possible cause of thoracic outlet syndrome. Common peroneal nerve decompression at the fibular neck. A: The common peroneal nerve (P) has been identified and mobilized proximal to the fibular tunnel region, fascia (F) covering peroneus longus. B: The common peroneal nerve has been traced through the fibular tunnel. The fascia overlying the peroneus longus muscle has been divided and the muscle (M) has been retracted. The fascial band overlying the nerve is released. Median nerve (M) after decompression at the wrist; note the congestion from the longstanding compression. The transverse carpal ligament (arrows) has been transected. Fat is observed distally.